We’re excited to announce that we have further details on eligibility for the upcoming HAVeos Distribution! We will distribute 50% of all HAVeos tokens to existing HAVeth holders with at least 1000 HAVs. Havven is launching on EOSIO to enable stable payments for EOS DApps. Havven will also remain on Ethereum; the port to EOSIO represents our team’s belief in the need for projects to stay blockchain agnostic. There will be two snapshots taken of the HAV balances on the Ethereum blockchain, a starting snapshot and an ending snapshot. There is a minimum number of 1000 HAV required to participate;Please note this refers to the HAV amount, not the HAV value. You will have six months to provide an EOS wallet address in which you wish to receive your HAVeos. We will provide a dApp where you can sign a transaction from the ETH wallet that contains the HAV with your EOS wallet address as part of the transaction. This dApp will be released after the second snapshot. All HAVeos in this Distribution will be escrowed for six months from the time of distribution, with monthly vesting for the next six months, i.e. each month, 16.67% of tokens will be released. There will be two snapshots of the Ethereum blockchain a month apart to determine HAVeth holders. The dates for these snapshots are November 20, 2018, and December 20, 2018 (noon AEDT). HAVeth holders must hold at least 1000 HAVeth on the date of the second snapshot to be eligible. The number of HAVeos received is determined by finding the average holdings on both dates. For example, if Alice holds 500 HAVeth on Nov. 20 and holds 2000 HAVeth on Dec. 20, she will be registered as holding 1250 HAVeth her proportional of that amount. As a counterexample, if Bob holds 2000 HAVeth on Nov. 20 and holds 500 HAVeth on Dec. 20, he will be ineligible as he is holding less than 1000 HAVeth on the 20th of December. At this stage, there are no exchanges supporting the HAVeos Distribution. This means that unless we communicate otherwise before the first snapshot, exchange wallets will not be supported. All escrowed HAVeth and Locked Haveth will be included in the snapshot calculations. There will be 100,000,000 HAVeos created, and 50,000,000 HAVeos will be distributed through this process. 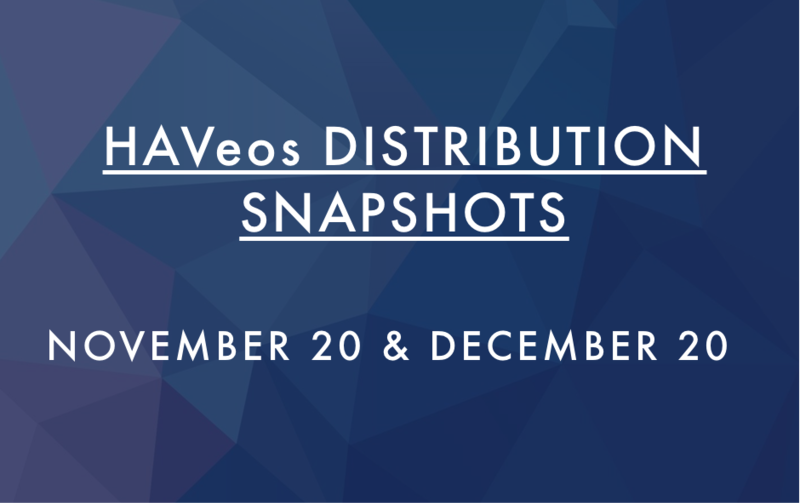 However, due to the 1000 HAVeth minimum, some holders will not be eligible to receive any HAVeos, these HAVeos will be distributed proportionally to eligible HAVeth holders. If you’re looking to purchase more HAV, it’s traded on KuCoin againstBTC, ETH, and USDT, as well as on Gate.io against ETH and USDT. If you have any more questions, come join us in Discord!